Finance Minister Mangala Samaraweera has presented praise worthy budget which is not a burden to the economy despite several elections on the cards for 2019, said Governor Central Bank Indrajit Coomaraswamy at the second Monetary Policy review press briefing at CBSL auditorium yesterday. The Budget is a workable one and does not contain too much of uncalled for expenditure despite several elections looming, he said. The Board was also of the view that, if the current trends in global financial markets, trade balance, and credit growth continue, policy interest rates could be reduced in the period ahead, given well anchored inflation and inflation expectations. Coomaraswamy also said that for the first time since 2013 October the trade deficit is at its lowest and this is due to curtailing unwanted imports such as gold and vehicles, low oil prices, developments in the global economy and prudent economic management. He said that the economy recorded a modest growth of 3.2% during 2018, compared to the revised growth of 3.4% in 2017. The growth in 2018 was largely supported by services activities that expanded by 4.7% and the recovery in agriculture activities, which recorded a growth of 4.8%. The growth of industry activities slowed down significantly to 0.9% during 2018, mainly as a result of the contraction in construction. 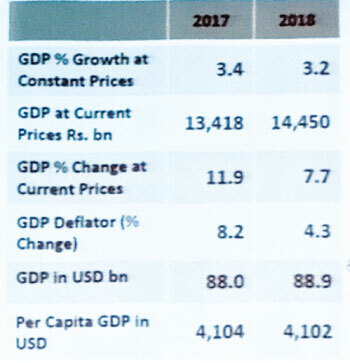 Despite the recent uptick in inflation, inflation is expected to remain in mid single digit levels in 2019 and beyond Headline inflation, as measured by the year-on-year change in both the National Consumer Price Index (NCPI) and the Colombo Consumer Price Index (CCPI), remained below mid single digit levels. “Inflation is likely to remain within the desired range of 4-6% in 2019 and beyond, with appropriate policy adjustments”. The increased tourist arrivals in the first quarter of 2019 helped improve associated earnings, although a moderation in workers’ remittances was observed during the first two months of the year. The receipt of proceeds from the issuance of the International Sovereign Bonds (ISB) helped increase gross official reserves to an estimated US dollars 7.6 billion by end March 2019, providing an import cover of 4.2 months. He however said that the growth of credit to the private sector decelerated during the first two months of 2019 and this was not something satisfactory. Credit to the private sector showed a net repayment to licensed commercial banks during the month of January 2019, followed by a marginal increase in February 2019.Year-on-year growth of broad money (M2b) also slowed down during the first two months of the year. Going forward, a growth of around 13.5% is expected in private sector credit in 2019.